Adding to my list of reasons to love New Zealand is the joyous Hobbiton™ The Movie Set. Mike and I spent our last three days in New Zealand on the North Island. We used Auckland as our home base, then ventured out on a couple of tours. Hobbiton was at the top of our list. 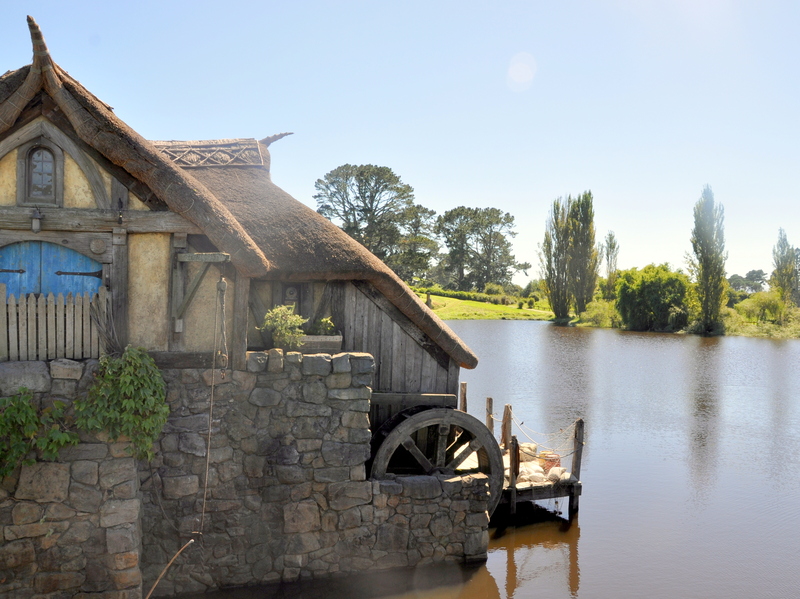 Director Peter Jackson filmed the Lord of the Rings Trilogy and the Hobbit movies throughout New Zealand, but he also created a gorgeous movie set on a 1,250 acre private farm in Matamata. 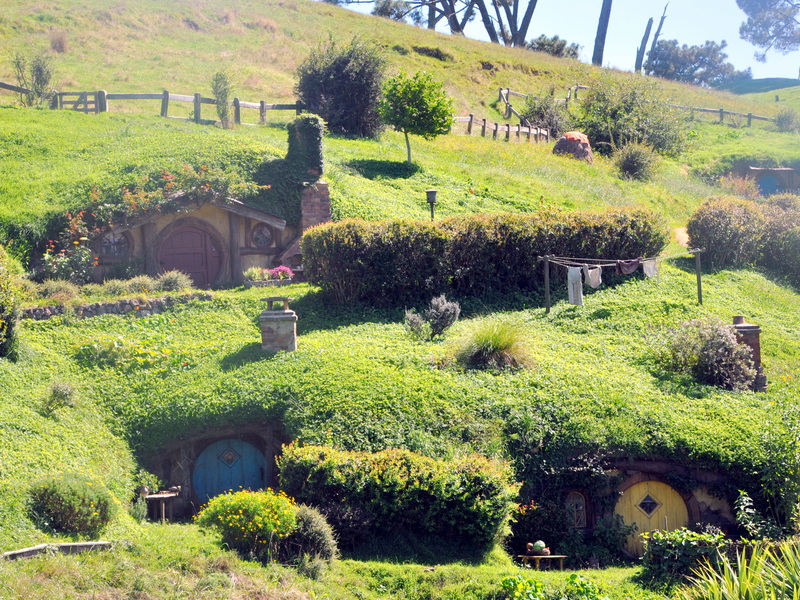 In 2010, the temporary movie set gave way to permanent structures and Hobbiton now draws tourists from around the world. The 12-acre set captures the magic of the movies and books. The walking tour fully immerses you in the experience. 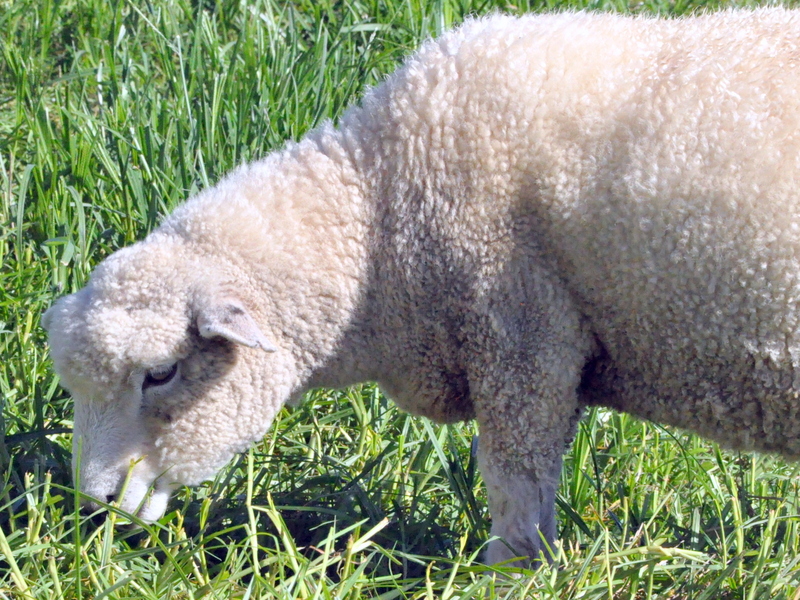 For this lover of books, movies, theater and gardening, Hobbiton has it all. If I could wave my fairy wand, I would take the tour a second time, but in slow motion. There is so much to take in and so many exquisite details. The Hobbit-hole facades are in different scales. Scale varies from 30 to 80 percent. A full-sized actor in front of a 30 percent scale set looks huge. This allows for the use of forced-perspective. In order to age the materials, set designers soak the wood fence posts in vinegar, then splatter the planks with blue paint, yogurt and wood chips. Soaking the wood in vinegar causes it to expand, then contract with a slight warp. Flecks of blue paint add to the aging process and the yogurt, a natural bacteria, allows lichen and moss to grow along the boards. Magical! 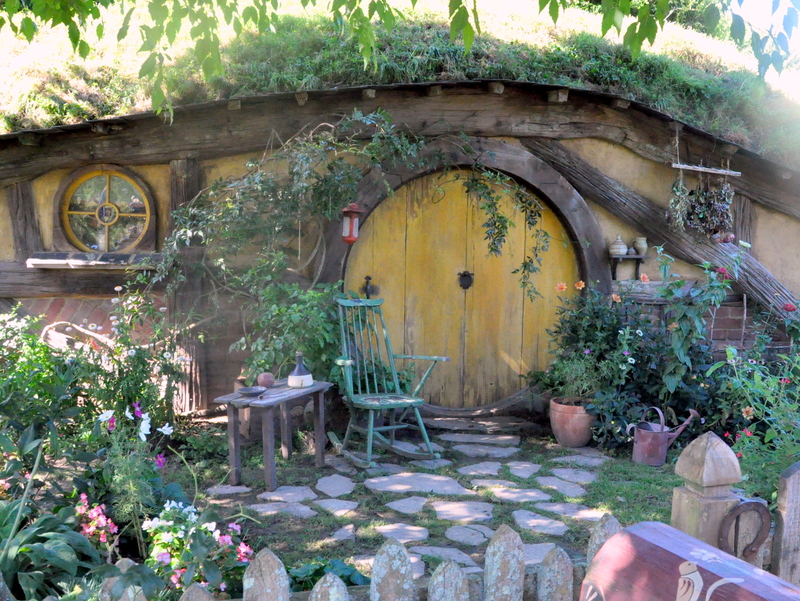 Each Hobbit-hole has its own garden along with props to indicate what the Hobbit does for a living. We meandered past the Hobbit holes of farmers, bakers, and homemakers. I delighted in the wee washing hung on the line, and the charming mailboxes, wheelbarrows and wind-chimes that make a house a home. What I didn’t expect and absolutely loved were the individual gardens. Hobbit-holes face out of the hillside with sloping, earthen green roofs. Flowers grow along the fence, up the side of the house and in planting boxes. Some of the holes have real vegetable gardens and in the middle of the Shire, pumpkin vines give way to magnificent fruit. You all know how I feel about pumpkins. 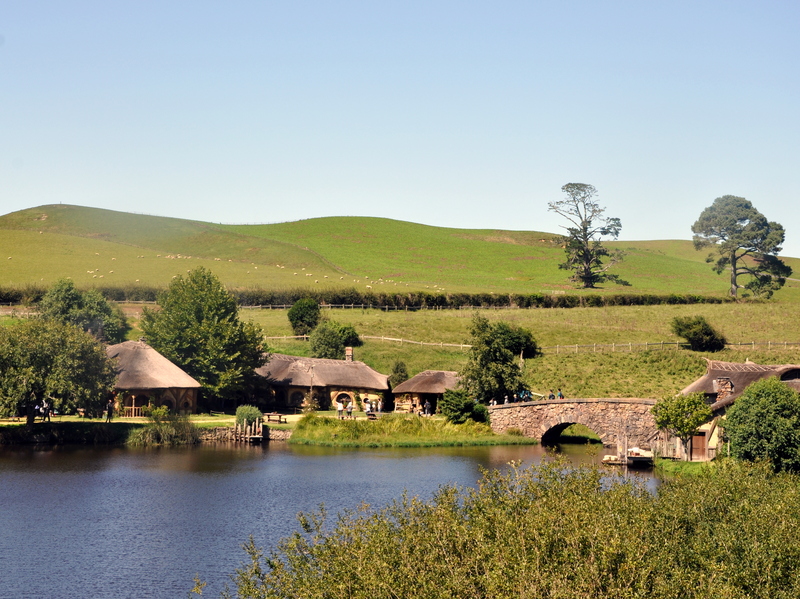 Hobbiton employs dozens of landscapers and gardeners to keep things looking authentic. Maybe we can get jobs here, too? Since the gardens are real, so are the visitors. I spotted bees, butterflies and birds throughout the tour. Aren’t they magnificent? As the tour drew to a close, we learned that one of the trees pictured below is a fake. Can you spot it? Updated April 23, 2018. You can learn the answer by following this link. Our tour ended as we crossed the bridge leading to the inn. The barkeeper offered us a choice of local ale or ginger beer, then we had lunch in a big tent. 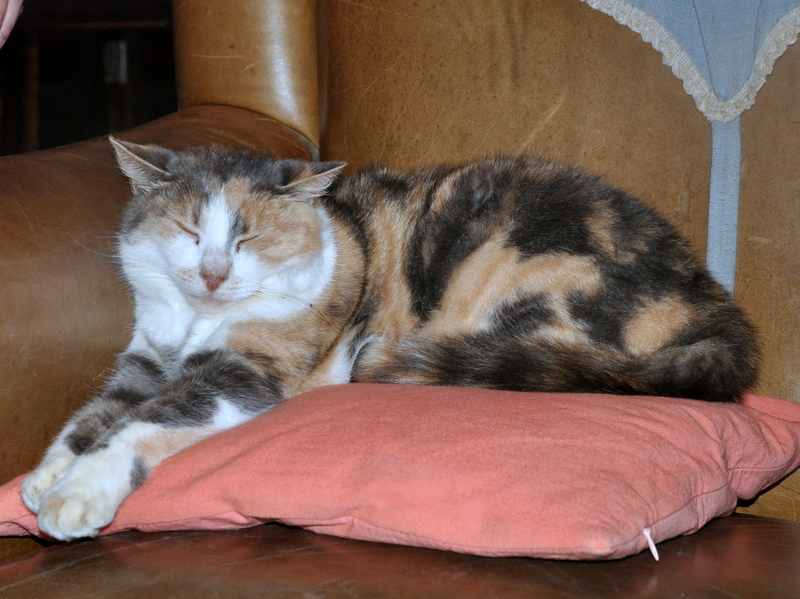 I almost forgot to mention Pickles the resident cat. We found him like this, eyes closed, paws outstretched, resting by a warm fire. 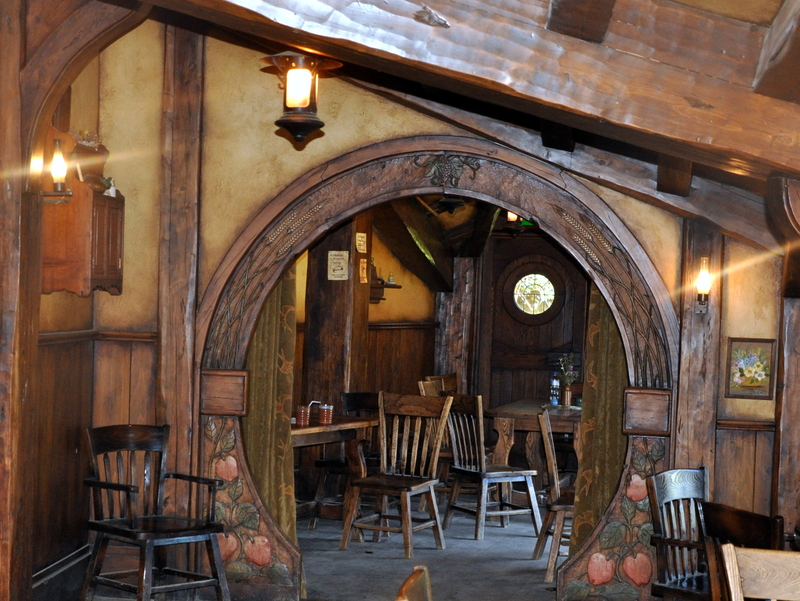 This entry was posted in Holidays and tagged Gardens, Hobbit Holes, Hobbiton Movie Set, J.R.R. Tolkien, movie set tours, New Zealand, North Island New Zealand. Bookmark the permalink. Cathy, it was truly a trip of a lifetime. Mike joined us for the second week. I flew with Laurie (who came across the US from Virginia) and we met up with the rest in Dunedin. We then drove to Wanaka, and Mike flew in and joined us a week later. What an amazing time. It looks like a wonderful day out, and full of fun. I’m a Kiwi originally, and I used to live about 6 km away from there and went to Matamata College. But it was long before the days of Hobbiton. Jane, I love this small world of ours. You lived in such a pretty area, though I suppose that is true of both islands. I’m in love with New Zealand, as you can tell. What brought you to Australia? It was a stepping stone to my first venture overseas at the age of 21. I spent a year in Australia, went to Europe and then back to Australia and met a man- as you do. I’ve been here ever since, but have made many many trips back to NZ. Jane, I love your story of travel and falling in love. I’m delighted to hear you make regular visits back home to your beautiful country. Pauline, you must go! This place is like nothing I’ve seen before, and it’s just two hours flight away. I agree: what a stroke of genius it was turning this beautiful set into a permanent attraction. It’s extraordinary. I admire the attention to detail, and the beautifully blending of fantasy and nature. Someone on the tour asked about the pumpkins, and the guide said they are shared by the families of the four gardeners. Can you imagine cooking up a pumpkin straight out of a Hobbit’s garden! So I’ve heard! Hobbiton postcards are on route to you all. Oh I am jealous! I can only imagine how delightful it was to admire all that beautiful detail. 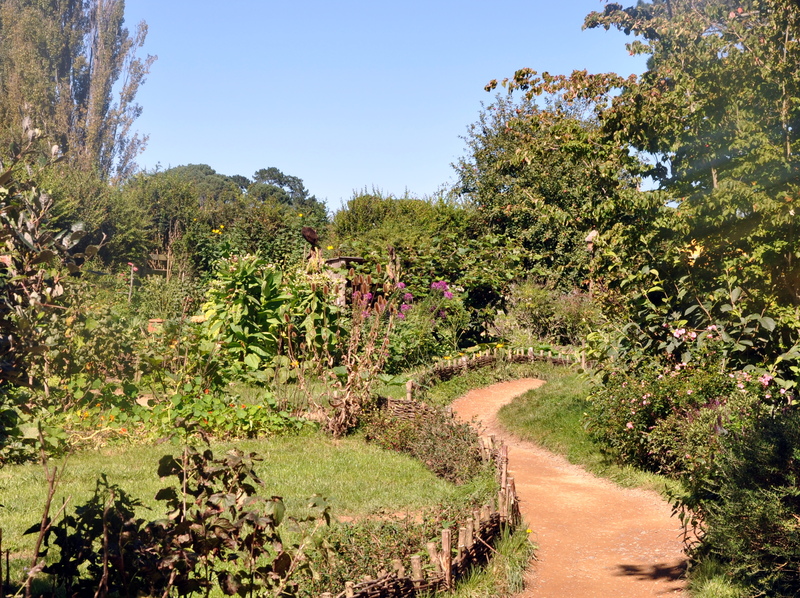 Little meandering paths, gardens around each turn, and butterflies! And to top it off there was a cat! I am so glad that you loved New Zealand (although show me someone who wouldn’t!) and how special to have had Mike with you too. Kate, you made me laugh. I’m 5’10” so the Hobbit-holes wouldn’t work, but I figured I could just spend all my time in the garden. 🙂 It’s nice to dream, eh? Marlene, this place is dreamy. I think reading the books probably enhances the experience in some ways but anyone who loves beauty, imagination, bird song and gardens would be right at home here. It’s lovely in every way. I’m glad you enjoyed the photos. At the end of the tour, I had a ginger beer and Mike had ale. We were all happy. Rowena, isn’t it fabulous? 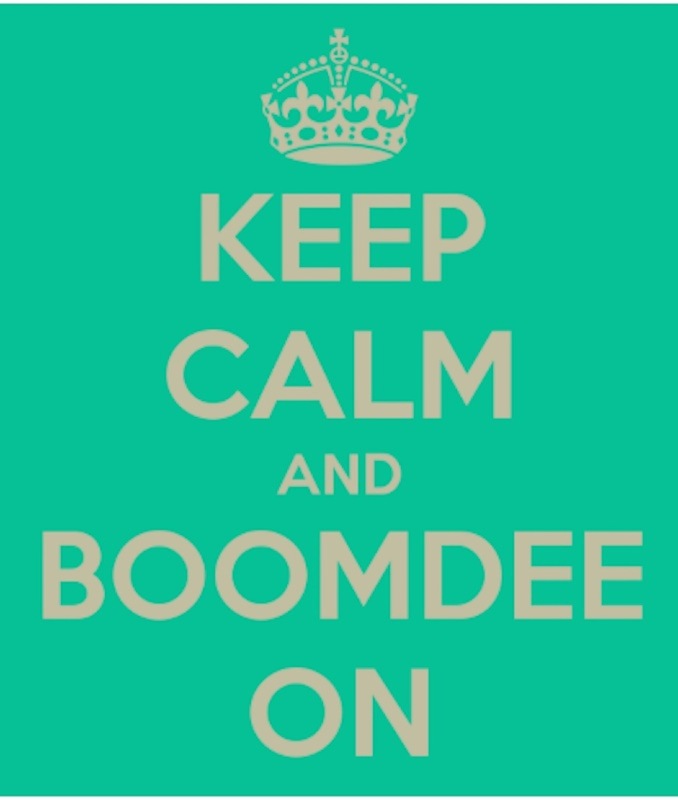 Do you live in New Zealand or nearby Australia? It’s such a long flight for us, but I want to come back one day too. Australia is another country I hope to visit one day. It’s been on my list forever. We thought of combining this trip, but it would be too many weeks away from home, with cats and one son still at home. I hope to get there in a few years, though. The area inhabiting Hobbiton is 12 acres, so it really is quite spacious. I think the tour took an hour. You could easily spend two hours, but the next load of people wanted their turn, too. I do like the idea of garden roofs, but I’m afraid my house is a bit of it’s league for this set up. I agree it would be fun though. Liz is still not 100%, sadly, but much better. I think her whole system really took a hit, poor thing. Thank you for asking. Oh good news on Liz. Going in the right direction at least. What a fun place to be the gardener! BTW, when do you reveal which tree is the Fake? They all look real. Oh my goodness…I need to do that. Thanks for the reminder. The oak tree is a fake! Can you believe it? I thought more people would guess Party Tree because it sounds made up. In truth, the tree is real but the scene shot there of a party helped dub the tree. How delightful! I was wondering if any of you would venture into this landmark. My friend’s brother-in-law lives in NZ and got to play an Orc in the movie. My all time favorite books! And to see Hobbit town come to life, I’m so jealous! The gardens are beautiful. Oh my gosh! What fun to play an Orc in this movie. Can you imagine? Stephen Colbert took his whole family there and also played a small role. These books are beloved by several generations. Mike still has his boxed paperback set on the book shelf. I hope you get to visit one day. You would love it. How perfect is this?? The place looks amazing–I can’t believe the attention to detail–and I can see that it’s right up your alley in all ways, including the cat! I like all the round doors best, I think. The photo of you and Mike at one of those doors is terrific! Kerry, aren’t those round doors fun? I loved that they were painted in assorted colors with different accessories to go with them. They’ve done a beautiful job honoring the stories. I don’t think fans would settle for anything less. It’s been years since I’ve read the Hobbit, but even someone unfamiliar with the books would love this place. Thank you! What a wonderful adventure! Hubs spent too little time vacationing in New Zealand before we met. It got cut short when he was called back to Canada to interview for a job (which he got and still has!). He’s a huge fan of the trilogy and the country; we’ll have to get back there one day to see all the sites. It looks fabulous! Oh Sara, you must get back there. I know I’ve been gushing on and on about the people and the place, but it is all true. I can easily imagine living there, if that were possible. I have one friend that moved there after a visit and has stayed ten years. Another friends parent’s spent six months of the year there before they passed. Everyone falls in love with New Zealand. Eliza, you are correct. The oak is a fake, the product of hours of meticulously adding all those leaves to the real trunk of a tree. All the interiors here are facades. The red door we’re standing in opens for a few feet for this one photo op. The tour guide stopped us there and took individual photos with our own camera which was really nice. What a treasure! Everything about this special site would be appealing. I’d heard some mention of it before but didn’t have any idea it would be so “alive” and not simply a movie set! The gardens are terrific in their individuality. You truly had a wonderful time in NZ, that’s certain! And your photos are wonderful, Alys! Thank you, Debra. Treasure is a great way to describe this place. The Hobbit-holes are simple facades, yet you felt that you could walk through the gate and knock on the door and perhaps the owner was just out of sight. The gardens are so beautifully maintained and carefully groomed to scale. Add in the rolling green hills, all those magnificent trees and it felt like a small paradise. I’m glad you enjoyed the photos. Thank you for your kind words, Debra. 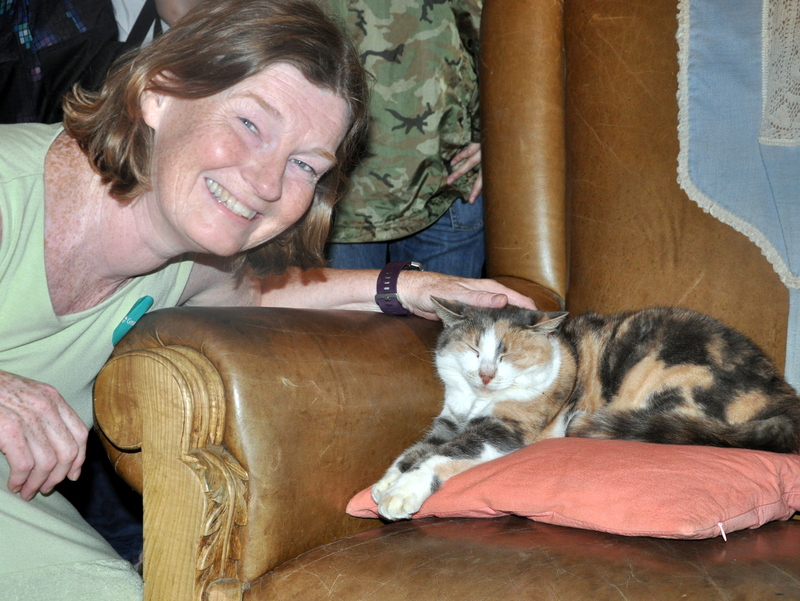 Alys, I enjoyed seeing your photos and hearing about your experience. I especially love seeing the gardens; so much beauty. All looks so magical and inviting. Would love to experience that some day. Nice Mike was able to join you, and also like the pic of you and Mike in front of the door. Thanks for sharing your adventure! Hello Maria! The gardens are well-tended and beautiful, helped along by all those visiting pollinators. You would love this place. I’m glad Mike could join us for the second week. He got to meet all of my New Zealand friends as well as Laurie. Kelly is the only one he knew beforehand. We had an amazing time. Oh, the detail! I don’t suppose I will ever get to see it, but I feel like I’m there thanks to your blog post – thank you! Sheila, it’s amazing. We were so lucky, too, to have an end of summer, warm and sunny day. They’re open year round, so I imagine it all looks quite different in the autumn and winter months. I’m glad you enjoyed my post. It took a long time to edit and place all those photos, but now that it’s done it feels like a scrapbook of our time there. Hello Dawn! Thank you for your kind words. 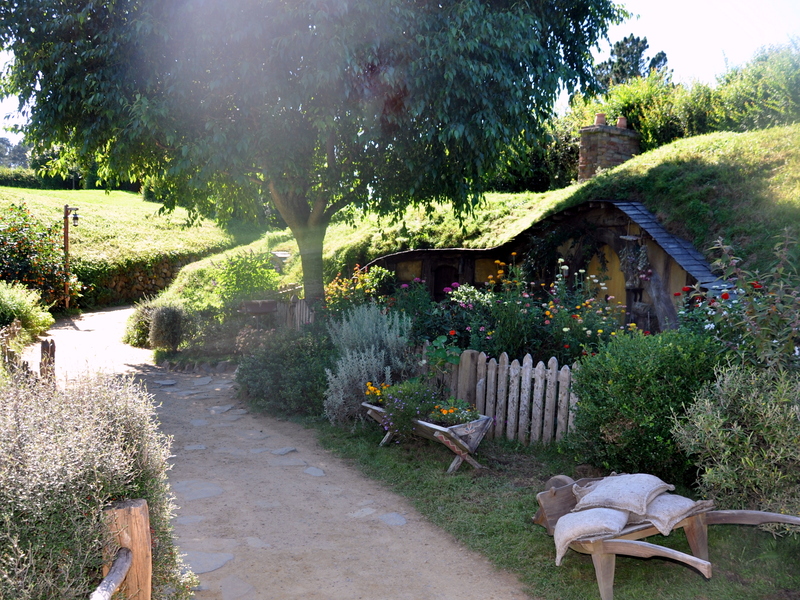 Hobbiton is gorgeous, and can be easily enjoyed by anyone. We had such an amazing time, and lucked out with perfect weather as well. That said, strolling through with an umbrella would have been magical too. What a place! Oh, I am SO jealous! But not *too* jealous, because I can’t imagine anyone more worthy of a visit to Hobbiton than you (with your kind soul and love for all living things). Thank you for sharing your adorable photos! What a privilege it is to follow along, if only vicariously. You are so dear. Thank you, HB. I want everyone to go to New Zealand and experience what I experienced. It’s a beautiful country. I hope we make it back one day Thank you for your kind words. Oh my soul how divine. Hobbiton feels like an old friend. I have read the hobbit and the triology at least six times. Your pictures are so evocative. The set is lovely and the gardens simply devine. I am so very happy for you. So do tell, ale, gingerbeer or second breakfast? . Wilma, I’m glad these photos evoked so many good memories. I hope you’ll get to visit there one day. I know you won’t be disappointed. It must be fun maintaining all those gardens and props to keep the place looking authentic. I loved seeing Hobbiton! My brother-in-law and nephew visited there 2 or so years ago but they brought back few pictures. You covered its magic must more thoroughly! Thank you, Kris. They were probably too awestruck to take photos. It’s a feast for the eyes and the senses. I hope to see more of New Zealand again one day. What a glorious place. Yay, I’m finally seeing this post! You know, having read the books 6 times, I never really wanted to see the movies, but oh my goodness, Hobbiton is enchanting! So very glad you went so we might all see your photos. Your close ups of the flowers and bees are excellent.